SERP has launched a new website which provides a host of road safety advice and information for residents of Essex, Southend-on-Sea and Thurrock. The site is a ‘responsive design’ which means it recognises the device the visitor is using (laptop, tablet, smartphone etc) and presents the site in the ideal format. The new site includes dedicated sections for different road users including parents and children, young drivers, cyclists, motorcyclists, mature drivers, pedestrians and people who drive as part of their job. The ‘advice’ section includes information about the new drug drive legislation (including prescription drugs), motorway driving, fatigue, and winter driving. There is also a section on child car seats which covers the law, choosing a car seat, the new i-Size regulations and FAQs. There is also road safety information for educational establishments – from pre-school to primary, secondary, sixth form and further education. The training section provides details of courses and other skills advancement opportunities for young drivers, cyclists (children and adults), motorcyclists. It also details driver and rider courses available in Essex through the NDORS (National Driver Offender Retraining Scheme) programme. Local residents can use the ‘your roads’ section to keep abreast of live incidents, road works and congestion across the county, and to report a problem such as a pothole or street light failure. 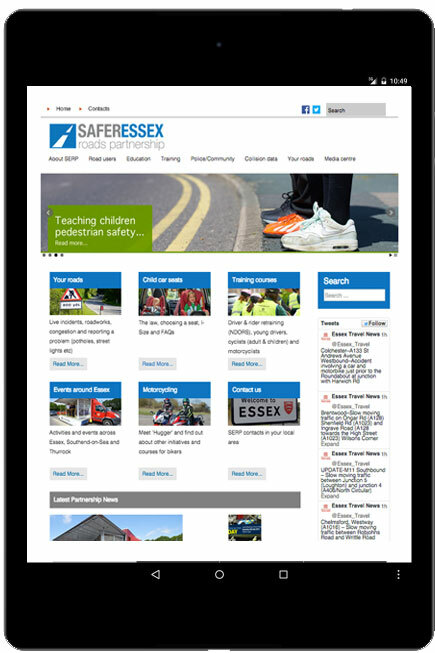 The new site went live on 1 July 2015 and will be regularly updated to cover the latest road safety news from across Essex, Southend-on-Sea and Thurrock, and further afield.